VW had been planning a long-wheelbase luxury Passat for a long time, partly as a replacement for the aged Santana that was so popular in the Chinese market. But for Europe, as well, the big Passat was on the table. The idea was killed off, for Europe at least, when Volkswagen decided instead to go even more luxurious, introducing the Phaeton luxury saloon as both an uber-premium and technological showpiece for the brand. 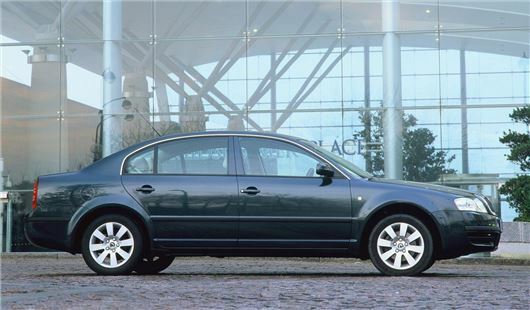 But the LWB Passat was so far into development that it wasn’t killed off completely. Instead, VW Group turned to its erstwhile budget brand, Skoda, to bring the car to market, based on an extended B5 platform (the same as the Passat) and aimed at bringing large car levels of space and comfort to a more affordable market. When it debuted in the UK in May 2002, the Superb got a brilliant reception. Here was a car that was broadly the same price as a Ford Mondeo or Vauxhall Vectra (or - whisper it - VW Passat), but with better equipment levels and astonishing rear legroom. It was full of clever touches, too, the most talked about of which was its integral umbrella - a feature that was only offered on one other car of its era, which was the Rolls-Royce Phantom. For £250k less, you got an equally well-concealed brolly tucked away inside the rear door panel; a nice touch from a manufacturer that was going out of its way to position itself as a brand that liked to give its customers the personal touch. The engine line-up was straightforward enough - 1.8 turbo, a normally-aspirated 2.0-litre and the 1.9 and 2.5 TDI units carried over from Volkswagen, along with a range-topping (and seldom seen) 2.8 V6. The 2.0 petrol was a bit sluggish, but stupidly cheap - you could get one for the same price as a well-specced Vauxhall Astra, and it was a lot more car for the money. The best-sellers were the diesels, though, many of which went on to become one of the best-loved Minicabs of all time, taking the Superb up to such hallowed heights as the Nissan Bluebird and Vauxhall Cavalier 1.7 diesel - cars that were considered indestructible and comfortable in equal measure. Indeed, the cab market is why you don’t see that many Superbs for sale any more. Their popularity meant that used examples were gobbled up and run into the ground, often shrugging off half-a-million miles with consummate ease. There aren’t that many cars of the 2000s that can do that. All of which proves that the Superb was a car that well and truly lived up to its name - it was very good indeed. But is that enough to make it a classic? After all, it’s still in production. The LWB Passat may not have been a thing in Europe, but in China the Volkswagen Passat Lingyu is the nation’s favourite taxi. And yes, it’s simply a badge-engineered first-gen Superb.